We started You and I in my junior year of high school. I was 17 years old, so roughly 21 years ago. Justin, Jon and myself started as the core group of the band. We went through a couple of line up changes for a drummer and second guitar player before we recorded. Some of the parts of these songs may have been written with a different drummer and second guitar player, but the majority of this was written by the lineup stated above. When we started the band I don't know that we ever really had any ambition to do a record or anything like that. Charles joined the band on drums and we started to solidify a setlist. We had some songs written that never got recorded from those early days. We were taking influences from a lot of different things; Frail, Reversal of Man, Converge, Indian Summer, Bob Tilton, Puritan, Groundwork, etc...we wanted to attempt to cover as much ground in a song without having it come off as forced. We played our first show in a friend's basement with Nora and Hour of the Star. We played as a 4 piece band with just me doing the guitar duties alone. Casey Boland was at the show and saw us. A month later we asked him to join the band. Our good friend Jeff Patterson, the guitarist from Hour of the Star, saw our first few shows and decided he would start a label to put out a 7" for us. He started Sage Records and we were his one and only release. We got to work and wrote a couple more songs with Casey on second guitar. Casey and I seemed to work well together and played off each other in a very natural way. I loved what he added to the existing songs. Musically, I wrote the basic structures for "Something to Remember", "Silent Mourning Whisper" and "Seascape". I felt like I was finally writing some of the music that was in my head, actually transposing it into real songs. Jon wrote pretty much all of "Hears Divide". Justin wrote all the lyrics for the record. We had been in a band previously together, but with You and I his writing was getting more poetic and abstract. It seemed to fit the dynamic of the music well. We recorded the 7" in one night at a placed called Third Studio From The Sun in Wayne, New Jersey with an engineer named Dave Meyer. When we finished it I couldn't believe what we had just done. I remember being very proud of it and couldn't wait to share it with my friends. Listening to it now, I'm still pretty happy with how well it captured that time of my life. I recall one thing people noted back then was that we had multiple vocals happening throughout the record. There was alot of off key singing from all of us and parts with competing screams. At the time I guess this wasn't so typical. The record could probably benefit from an updated mix if we had access to the original tapes, but as it stands I think if it came out today I would still be excited about it. That's very rare to me. Jeff had blank manila envelopes with the songs and his label logo screened on the back. The front was totally blank. We split them up, making about 7 or 8 different versions of the record covers. I did mine in my high school art class. It was a fun approach since we split them up and no one took on too much work. We photocopied the inserts from a cut and paste layout that I put together. It's very 90's. Once Casey was in the band we started writing songs very quickly. We were practicing once a week and the band was such a huge focus for me. By the time the 7" came out we had already written enough material for an LP. "Absence" was written back in 1996 with our first lineup, but didn't make it onto the 7". 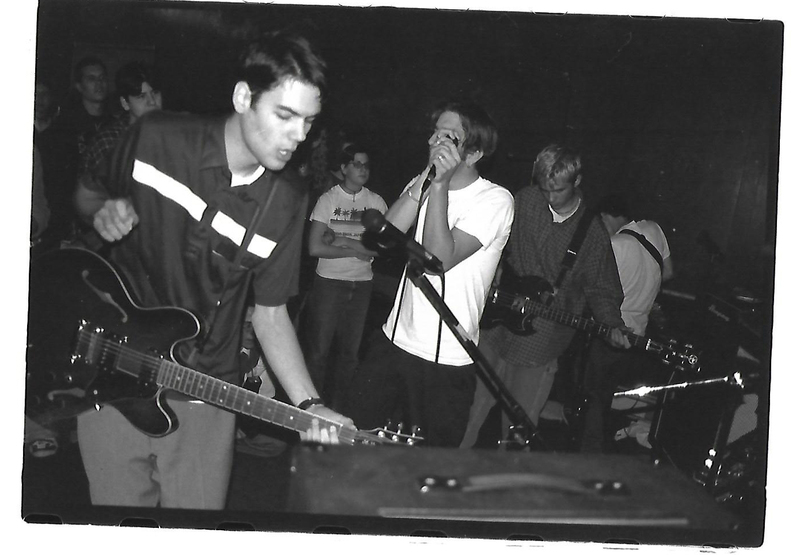 The rest of the LP was written when Casey joined the band. We went back to Third Studio From the Sun to record. We hadn't found a label to put it out before recording. We had asked Ebullition Records and they told us to record the LP and send it to them; they would then decide if they wanted to do it. We also inquired into a local called Spiritfall Records and they told us they would consider it. Dave Meyer produced the record in two 6 hour sessions. We were pleased with what came out of it. We saw it as a logical extension of what the 7" was. 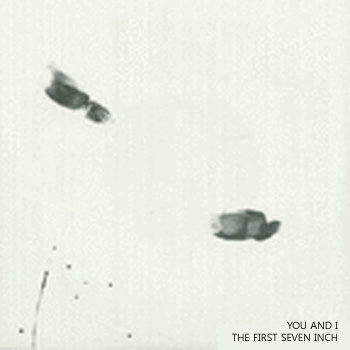 The difference being that the 7" worked as one long composition, the LP felt more like a collection of individual songs, some better than others. A couple of the songs on that record like "When We Were One" and "Absence" became anthemic favorites that people would ask us to play on a regular basis. That was quite humbling to have that kind of reaction. Spiritfall agreed to do the LP and we got to work with a simple layout, coming up with a song order and sending it to press. We had plain black LP jackets with cut and pasted decals for the front and back. The inserts were again photocopied. It was a labor of love. Listening back to it now, I think side A is pretty solid and consistent. Similar to the 7", that first side sounds like one long piece. Side B is a bit more patched together, all the songs sort of have their own individual characteristics that set them apart. Just before that summer Charles Butera quit the band. We had a tour planned with a band from Florida called Song of Kerman. Chris Boland, Casey's brother, said he would play drums for us. Chris's style was very different and his interpretation on some of the songs added a different life to the songs. Other songs were out of his range of playing and we ended up dropping a good chunk of those songs with the lineup change. Chris's first show was also our first day of tour. I imagine that was probably nerve racking for him but he played wonderfully. I would bond with Chris over the next two years in a way that could only happen when people play music together. 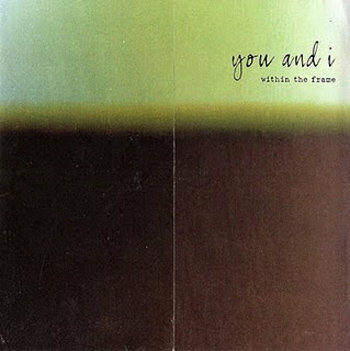 We wrote the songs for “Within The Frame” with Chris playing drums. He had a different style than Charles and definitely played with more emotion and feeling. It made the live setting more intense and I think his presence took the band to another level. We started to really push ourselves when writing. Some of the songs would stretch on to 5 minutes or more. Everyone was in college at this point and we would meet on the weekends for shows and practices. Casey very much liked a fast and frantic band from France called Fingerprint (I think members were also in Jasmine). He showed up with "All Imperfect Things" totally written and we all immediately understood the influence he was emulating from. Casey, Justin and I had all became pretty enamored with a band called Ethel Messerve. After seeing them play in the summer of 1997 I had always wanted to write a song that was highly influenced by them. "A Day That Passes Through Us" was the result. I wrote it from start to finish one day and showed it to the band. Those songs are definitely the outliers on the record, which was a nice break from the chaotic metal influenced stuff I had started to mostly write. "Forever Lasts A Moment" was a group effort. I think I wrote the beginning, Jon the middle and Casey the end. The song is sort of a journey through everyone's contributions. Six songs came together pretty easily. We played them out at shows quite a bit that year and got very comfortable with all of the small intricacies of them. As per regular operation, we called Dave Meyer and went back to Third Studio From the Sun. This time Jameel from Spiritfall Records had offered to do the record before we recorded it. Toby from Your Best Guess offered to split the release. Unfortunately the record suffered from production flaws. It sounds very digital and not very warm. I'm not sure what we did wrong this time. It's tragic really, this was the best time of the band and some of our best material, yet the documentation for is not quite representative of what those songs conveyed in a live setting. We wrote "Broc Landers and The Mustang Candy Cake", "143" and "Threading a Needle" before Jon left the band. The rest of the songs were written with Justin playing bass. The actual writing of the record was different due to the lineup change and shifting tastes within the band. We were somewhat preoccupied with Justin learning the old songs on bass and figuring out how to play those songs as a four piece band. With Justin on bass the new songs found Casey and I taking on more vocal duties than before. I had written basic structures for "Tell Me About Your Childhood", "Broc Landers and The Mustang Candy Cake", "Playing Off the Story" and "143". Oddly enough "I Think I Know Where Elvis Lives" was written around a series of drum beats Chris had strung together into a song. We tightened up a little bit of it, but the overall structure was written entirely on drums with guitars accommodating the beats. Casey gave us some more Jasmine-influenced melody with mapping out most of "Pulse". 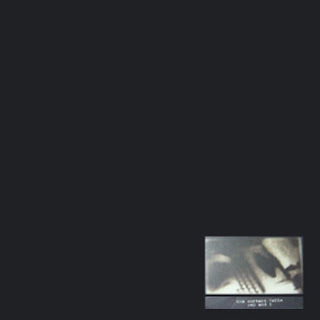 I channeled Jawbox's "Savory" for the ending of "Pulse" and we had the song finished. "Two Down, One To Go" was another ode to Ethel Messerve. We road tested the songs on a tour that winter with Saetia. By the end of the tour we felt confident about our ability to be a four piece band. But, by that Spring Chris's heart and breathing issues had started to get more serious and his doctor advised him against playing drums. We were going in different musical directions already so keeping the band going after Chris's departure seemed like a move none of us wanted to make. We didn't actually go into the studio to record "The Curtain Falls" until after the band broke up. Steve Roche was at Level Plane at the time. He encouraged us to go to WGNS in Washington DC to do the album since Saetia had recorded there before. I felt a bit strange driving 3 hours to a studio to record an album for a band that was already broken up. We hadn't practiced or played together since the last show. We ended up driving down to WGNS and recording with Jeff Turner. He didn't care for our music and wasn't shy about letting us know how he felt about it. He seemed preoccupied the whole time and didn't really seem to want to invest much into it. The first night he actually left early to go to a party. He was at least 10-15 years older than us, so I can see how we probably came off totally unprepared and annoying. Recording was sort of a mess. There were parts we had to rewrite on the spot, or change because we couldn't remember how they went. Jeff suggested we record all the vocals at once in the same room which made the process harder. He seemed to mix it quickly and before we knew it were on our way back to New Jersey. At the time I was not pleased with the final product. It's definitely a group of individual songs, not a whole piece. It was dirtier and more raw than anything else we had done. 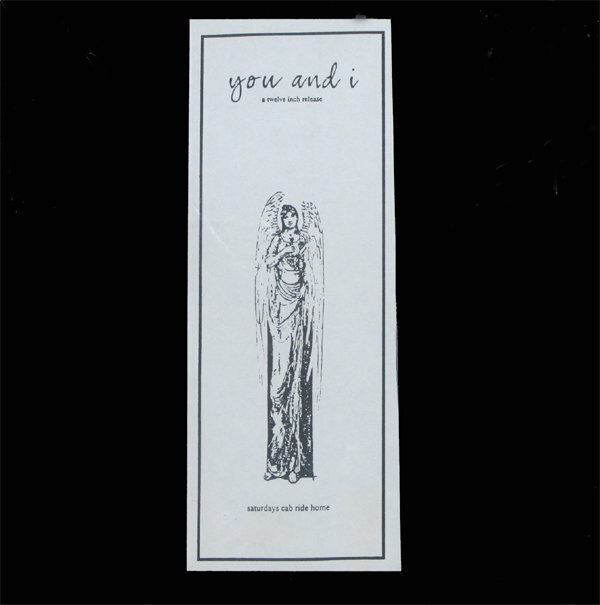 I remember getting the test press and thinking it didn't sound like a You and I record. I was living with Geoff Rickley from Thursday at the time and I left the test press on the kitchen table with a note asking if he could listen to it. He wrote up a song by song description of what he thought of it, I wish I still had it. Looking back, for having only played bass a short time, I think Justin managed to get a great bass tone. It really drives the record well. The drums also sound way more wide open on this recording. If we had to have a "break up" record then I think this is a good one. It gives small previews into where the band would have went while outlining some of the characteristics the band had become synonymous with. Some songs are pretty definitively You and I, while other songs are You and I experimenting with a non-existent future version of itself. 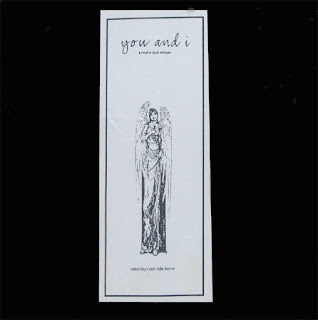 The record came out while I was on tour with The Assistant (my band after You and I). It was strange because it was selling quite well. You and I seemed to have suffered from the detriment of being more popular after we broke up than when were a band playing to 25 kids in a basement. I feel very humbled by all of it, 20 years later."